As part of our extensive collection, these Sterile Powder-Free Nitrile Gloves have been designed for use in surgical procedures, dentistry applications and all invasive tasks. Their powder-free design works to reduce the absorption and spread of environmental allergens while the sterile nature is vital for reducing the risk of both infection and cross contamination. Each pair has been individually wrapped with easy-tear packages to maintain this protection and help with convenient storage. During production, these nitrile gloves are pre-folded at the cuffs to ensure your fingers never touch the outer surface and include a sterile field to maintain the internal package environment. They have been textured throughout to provide excellent grip with a range of different sizes to suit your hand shape. 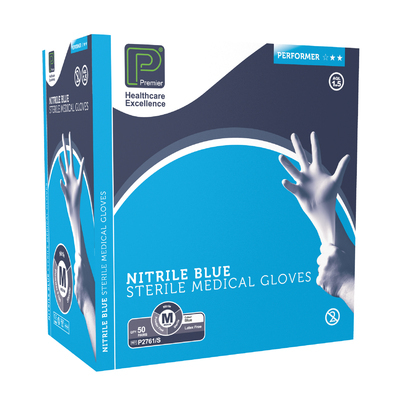 We also stock these sterile nitrile gloves in a Large size. Alongside this, we have an extensive range of Gloves for all different scenarios including our Cotton Gloves in White which are suitable for latex sufferers and our Vinyl Gloves in both Blue and Red.